There was a field goal attempt during the second quarter of the Cotton Bowl on FOX between Oklahoma State and Missouri Friday night that got me thinking — I know, always dangerous. Here was the situation: Oklahoma State had the ball, fourth down and 7 at the Missouri 17-yard line with 14:14 left in the second quarter with the score tied at 7. OSU’s Ben Grogan attempted a 34-yard field goal and the ball hit at the very top of the right upright and bounced off wide and was no good. Most football fans watch on Saturday and Sunday, which means you watch college and pro football. Several rules are different, and some clearly to me could be the same, like when a field goal is good or not good. The rule in college football is that the entire ball must pass inside the inside edge of the upright. In the NFL, in order for the field goal to be good, the ball must pass inside the outside edge of the upright. You are only talking about a 3-4 inch difference. Why can’t rules makers just get together and make a simple rule the same on both levels. 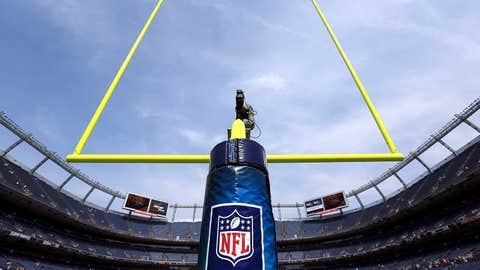 The measurements in the NFL rule book state that the uprights should be no less than 3 inches and no more than 4 inches in diameter. It would almost make sense to me, with more skilled kickers in the NFL, if the rules makers would make it harder for them to convert. In the college game, Grogan’s field goal was clearly no good. In the NFL, Grogan’s field goal might have been pretty close, but in my opinion, still no good. Maybe one day the NFL will reconsider its criteria and follow the college’s lead. I think the league would be smart to do so.